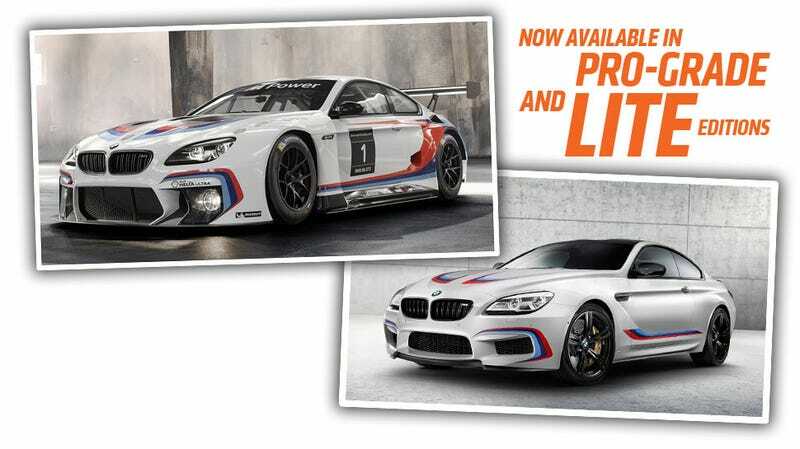 BMW has given us a glorious double-whammy of M6s and red and blue stripes as they finally showed their M6 GT3 race car and the similarly-livried M6 Competition edition, available to us mere mortals. Well, mortals with money. These are both fantastic-looking cars. The new car is powered by a 4.4-litre V8 engine with M TwinPower Turbo technology, which has been modified for use in motor racing. The power train has dry sump lubrication and generates up to 585 hp – with the whole car weighing less than 1,300 kilograms. Perhaps the most obvious difference from the production M6 is that the driver sits centrally in the M6 GT3, an option not likely to find its way into showrooms any time soon. The wing, flared fenders, and traditional BMW M livery make this a pretty stunning looking racecar, and if you have about $430,000 and a competition licence, it could be yours. If you’re not really all that committed to devoting your life to racing, there’s still another pretty good option. The BMW M6 Competition Package gives a lot of the look of the GT3 car, complete with a slightly toned-down but still exciting M-stripe livery, and a bit more HP as well, since there’s no race rulebook breathing down your neck — 600 HP (and 516 lb-ft of torque), up from 575 HP from the previous competition package. BMW did the right thing and went bold with the two colors schemes available for the Competition package — white with the red and blue stripes and a good Austin Yellow. There’s also carbon fiber all over the place inside, lettering reminding you bought the “M6 Competition” package and that you made the right choice, and a voucher for a half-day at the BMW performance driving school, which is a blast. You’ll need $165,850 to get one, and you’ll need it fast, because there’s only going to be 100 sold in the US. And, before you ask in the comments, I’m broke and can’t lend you any cash right now. Sorry.